To celebrate the beautiful fall weather, I recently took a trip to Chicago in the 2013 Volkswagen Beetle Turbo Convertible to meet up with some friends and explore the city. Over approximately 500 miles of driving round trip, I was pleasantly surprised by the Beetle's versatility, as it showed its strengths as both a pleasant highway cruiser and a peppy city runabout. The four-hour trek from our Ann Arbor offices to the Windy City was mostly uneventful except for a short period when I was heading directly into the setting sun. The Volkswagen's sun visors were no match for the angle of the rays. Road test editor Chris Nelson had a similar problem recently, noting that the large visor not only has trouble covering the fairly upright windshield but also blocks too much of the driver's already-compromised sightlines. When angling the driver's seat didn't alleviate the problem, I settled for an hour or so of squinting through the windshield. It's ironic that there would be such a problem with the sun in a characteristically sun-loving vehicle. Other than that, the Beetle Convertible was a great highway car thanks to its a planted ride, good on-center feel from the steering, and tall gearing that keeps the turbo four-cylinder quiet at cruising speed. In fact, the gearing was so tall that the cruise control was set to 75 mph for more than half an hour before I realized that the transmission was in fifth gear rather than sixth. This gearing may be one of the reason's we've previously noted the Beetle's relative sluggishness compared with the GTI, but it's a boon on the highway where the Bug is relaxed and comfortable. As I got within reach of downtown Chicago, I was held up by quite a bit of Friday evening traffic on Lake Shore Drive. Rather than get frustrated, I decided to lower the top, which was easy to do even while on the move, as the Beetle's roof can raise or lower its top at speeds up to 31 mph. Later that weekend, I took the Beetle around the city with three friends in tow in what turned out to be perfect convertible weather. They loved the Beetle's styling and complimented the color combination of the red exterior and the tan interior. "This is the perfect car for Instagram," one of them declared. Four people fit very well thanks to decent legroom in the backseat, and the Beetle felt like it was in its element in the city, as the 2.0T engine provides enthusiastic low-end torque for moving away from stoplights and the accurate but light steering gives the VW an agile feel around town. However, when it came time to put the top up, the backseat passengers started to feel claustrophobic and began complaining about the sudden lack of headroom. As one of my friends put it, "It gets really sad in here when you have to put the top up." The trunk was pretty sad as well; two small suitcases quickly filled its 7.1 cubic foot capacity, relegating smaller bags to the already-full passenger compartment. Overall, the Beetle was a charming weekend companion. Our Bug is now in shape for the winter months, as the dealer was able to fix the niggling passenger-side door rattle that was being caused by a loose panel clip inside the door. 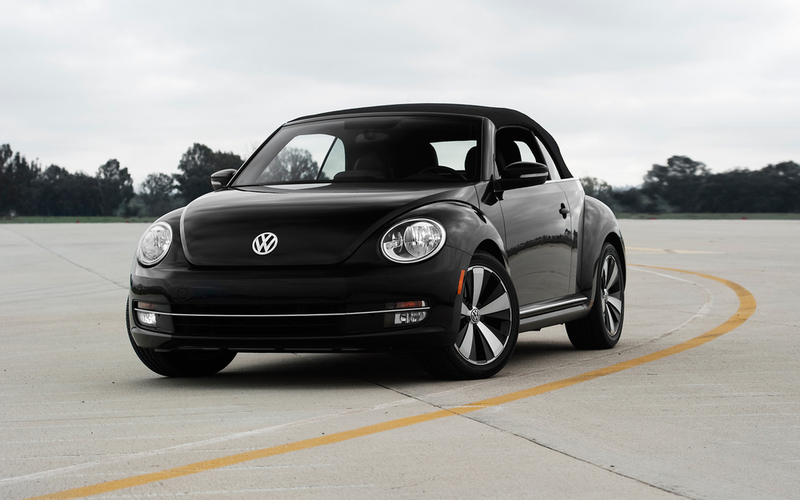 Check back next month to see how the Beetle Convertible copes with rapidly dropping temperatures.